Have you been to the USDA's new site for parents? 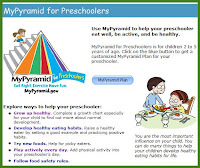 Check out the preschoolers site for ages 2 to 5 and their kids site for ages 6 to 11, for great information about food and kids. I am always keeping an eye out for good resources on food. My sweet little boy has had eating issues since day one. We even spent a year working with the feeding team at Children's Hospital of Philadelphia (with great success - we really loved their nutritionist and psychologist). So back to the USDA's site ... I liked their individualized food plan. It is not very complex, but it gave me a better idea of how much and what my son should be consuming on an average day, based on his age, gender and activity level. 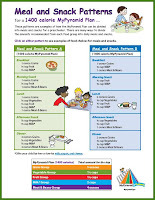 They also have meal and snack ideas for four different calorie levels (I found out my son's calorie level on the individualized food plan). In these plans, they give more specifics on how to break down my son's food intake over the course of the day. 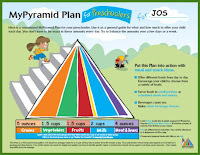 Their site contains some simple advice about picky eaters, growth charts, and plenty of information about FOOD. It is a fun little site worth checking out.